Click on the links to see photos of the players. The order of the players is the same as that of the photos. Birth-dates are in parentheses. The teams are listed in order of last year's final standings. Beijing : Zhang Yining (82), Guo Yan (83), Li Qiangbing (85/4/30) , Zhu Hong. Guangdong : Cao Xingni, Wang Xiaohua (79/1/16), Mai Lele (81/2/14), Zhao Shuang (82/11/8), Tang Yuan (84/7/9). PLA-ICBC : Ding Ying (83/10/9), Wang Yuegu (80/6/10), Cao Qin (87/1/8), Mo Huizi (84/2/16), Sun Jin (80/3/13, inactive due to injury). Shanghai Telecom : Gao Jun (69/1/25, USATT), Yu Jingmi (80/1/4), An Konishi (80/12/16, JTTA), Jiao Yongli (83/4/8), Dai Ningyang (85/11/3). Henan : Guo Yue (88/7/17), Chang Chenchen (86/6/20), Shan Xiaona (82/1), Zhang Yu (84/6). Shanxi : Lian Xi (83/2/19), Fa Jiejin (83/8/24), Chen Qing (84/1/15), Ni Ju (82/1). Sichuan Telecom : Li Xi (86/2/22), Huang Yihua (85, Chinese Taipei TTA), Li Xiaoxia (84), Peng Luyang (86), , Lu Cuinan (82/1/31). Photo to the right: Cao Xingni from Guangdong. 2 points for a win, 1 point for a loss. Photo to the right: An Konishi (JTTA) playing for Shanghai Telecom. Last season Konishi played for the Shanxi team. After 11 rounds, the young Hebei club found itself on top of the standings at 11-0, an unprecedented Super League record. Hebei benefited from an easy schedule at the start of the season: it faced Sichuan and Shanxi in the first two weeks. Sichuan would eventually develop into a better team, but they were definitely inexperienced, having been freshly promoted to the Super League from the A-league. Sichuan was to take Beijing to a Golden Ball match later, and cleanly beat Liaoning in a subsequent round. The Hebei club has Niu Jianfeng as its ace. I would rank her as the MVP of the Super League at this point. She also plays an excellent doubles game with long-time partner Bai Yang. Unlike other club coaches, Hebei's coach Tang Yinsheng has been coaching his top players since they were juniors, and he had a great rapport with them. Also unlike other clubs, Hebei does not pay huge (by Chinese standards) salaries to its top players. Wang Nan makes about US $10K and Zhang Yining about US$7K from their Super League play; Niu and Bai make considerably less than that.The third player on the Hebei roster is chopper Wang Tingting, who was recently demoted to the 2nd national team from the main team. Wang compiled a 6-2 record in Phase 1, a surprisingly good result for her. Of all the clubs in the league this season, Hebei has the best team spirit, and I would expect it to win it all. A pleasant surprise is the play of Cao Xingni from Guangdong. She had a sensational performance at last year's National Games, almost upsetting the eventual winners Beijing. Cao was recruited to the national team on the basis of that performance. She has been a very steady player in the league so far. Wang Nan's club is stuck at 4th place, a somewhat disappointing result. Wang's teammates Li Jia and Zhang Rui are both very good players, and Wang/Zhang is an experinced doubles pair. One would figure that at least they could get to the Golden Ball match in every tie. Unfortuantely Wang had been the victim of several major upsets, and Li's play has been somewhat inconsistent. I would expect that club to make a run in the subsequent rounds. Another surprise is the play of Gao Jun, the oldest player in the League. 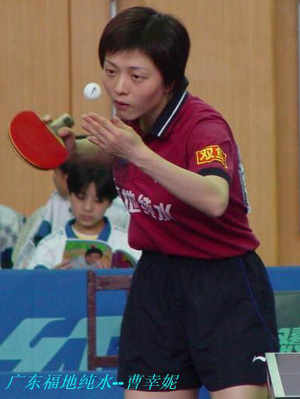 Gao played in the A-league last season, after a long semi-retirement from competitive table-tennis. She plays the old style of pips-out single-sided penholder smash/blocks, and should not have posed any problem for today's Chinese players. 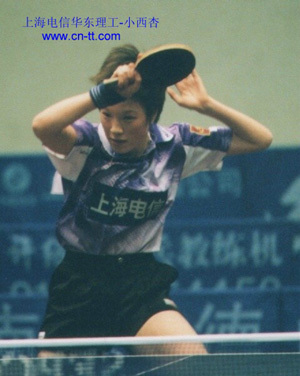 She has not played in every tie for Shanghai, and she appears to alternate as the number-one single player on the team with An Konishi. Gao has not lost a singles match yet. It will be interesting to see how the new service rule, which will be in effect starting phase 2, will affect the performance of the players.